Rock Maker 2.7 includes support for UV and SONICC autoscoring; score tooltips, and new score filters. Support for Rock Imager Auto Score. In support of Rock Imager's score scoring capability (introduced in Rock Imager 2.9), Rock Maker 2.7 displays these auto scores in Image View. 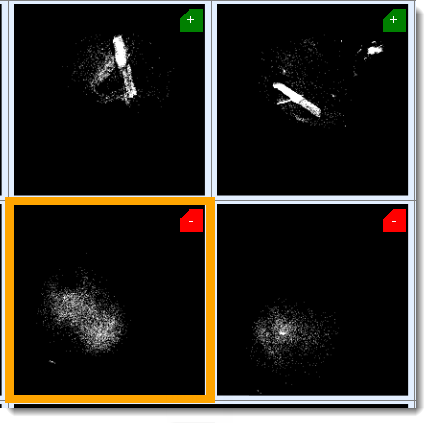 The examples below are UV-TPEF images acquired with a SONICC imager. Mousing over the score in Rock Maker displays basic information about the score's origin, e.g. 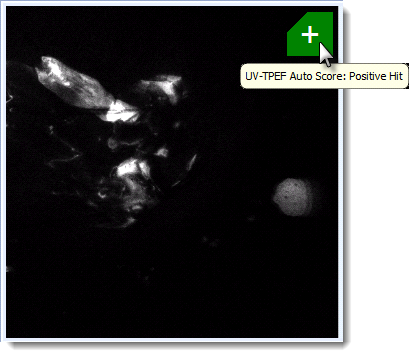 "UV-TPEF Auto Score: Positive Hit". Note: Auto Scoring is only available with Rock Imager 2.9 and either UV imagers or SONICC imagers. You can also use auto scores as a Search and Filter parameter. Score information tool tip. Hovering over an auto score with your mouse now displays related information in a tool tip, helping you identify which imager registered the hit or miss; what the manual number score means, and so on. For example, if you configured a hotkey score of 3 to signal a drop showing a full precipitate in General Setup, mousing over the 3 would display: "Manual Score: Full Precipitate". This capability is particularly useful with auto scores if you have both SHG and SONICC imagers and the imager default is SHG light. Interface changes. To support the new Auto Score functionality and to add flexibility to Compare View, we expanded the toolbar to include five new buttons. “Auto Score Highlighter” outlines each drop in green, yellow, or red to represent positive auto score, mixed scores, and negative scores. “Auto Score Filter: All Hits” shows you only drops that were scored as a positive by all auto score-capable imagers. “Auto Score Filter: Any Hits” shows you drops that were scored as a positive by any auto score-capable imager. Additionally, there is a new Auto Score tab that allows you to change the thresholds for positive and negative hits. If you do not have a UV imager, the UV auto scoring controls are grayed out.